The Undercliff Walk runs from behind Asda in Brighton Marina to the Brighton & Hove city boundary at Saltdean. The path is a total of 3 miles long. Both pedestrians and cyclists can use the Undercliff Walk. Sheepcote Valley is a popular public open space of about 90 hectares (220 acres), mostly in the South Downs National Park where it extends in to the city, including chalk downland, scrub and woodland. Until the 1980s some of the area was still farmed and part was a municipal tip. There is also a racing horse gallops and a caravan and camp site. Grazing is gradually being re-introduced to some of the slopes. Sheepcote Valley and East Brighton Park are in Black Rock Valley. 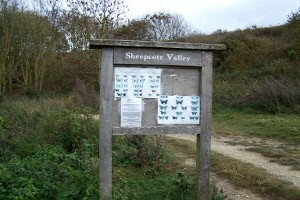 A map of the Sheepcote Valley is available. Ovingdean is a small village between Brighton and Rottingdean. St Wulfran's Church is mentioned in the Domesday Book and Ovingdean Hall is now a school for deaf children. 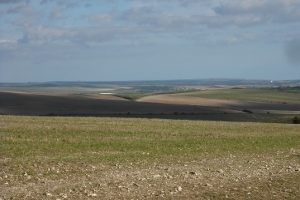 The countryside around the village is in the South Downs National Park at the point where it first meets the coast from Winchester. Adjacent to Happy Valley recreation ground, off Falmer Road, is a Site of Nature Conservation Importance (SNCI) which is open access land. In 2007, through the council Downland Initiative, the Happy Valley SNCI was linked to an enlarged Mount Pleasant SNCI, which in turn was linked by a wildlife corridor (or buffer strip) to Cattle Hill SNCI. As well as being open to access on foot the SNCIs support a range of habitats including woodland, scrub, rough grassland and ancient chalk grassland. A map of the Ovingdean area is available. 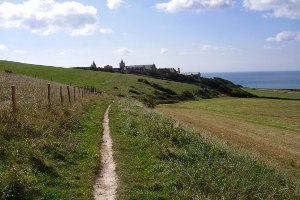 The area of Balsdean extends north from Rottingdean towards Castle Hill and is in the South Downs National Park (except Rottingdean village itself). 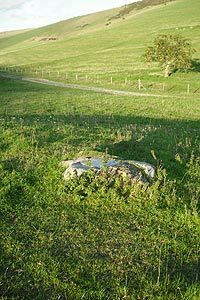 There are several important archaeological sites, as well as the lost village of Balsdean, including a cross dyke and burial mound on Bullock Hill and further graves at The Bostle and in Newmarket Bottom. All the buildings at Balsdean were destroyed by army training exercises in the Second World War including Balsdean Chapel and Norton Farm just to the north. Although the site has since been levelled and grassed over some evidence remains of the small settlement. A map of the Balsdean area is available. Pickers Hill rises north from Saltdean between High Hill, Highdole Hill and Castle Hill all in the South Downs National Park, with views east over the downs to the Seven Sisters and south over Saltdean to the sea. "John Harvey Esq of Ickwell Bury in the county of Bedford died suddenly on this spot on the 20th day of June 1819." Looes Barn Woodland Site of Nature Conservation Importance (SNCI) is important for nesting birds and Wivelsfield Road Grassland SNCI is another species rich area of chalk downland. Further east are Coombe Farm (also open access land) and Quarry Field SNCIs which support species such as Common Spotted Orchid and Chalkhill Blue butterfly. A map of the Saltdean area is available. A walk in the Lewes Road Cemeteries brings back the past, and much of the history of Brighton, in a way that few other places can. The cemeteries are also a haven for a huge variety of wildlife, with trees, woodland and meadows, which are carefully maintained and managed to encourage wildlife to thrive in an urban environment. A free Wildlife of the Lewes Road Cemeteries leaflet is available. A map of the Lewes Road area is available.